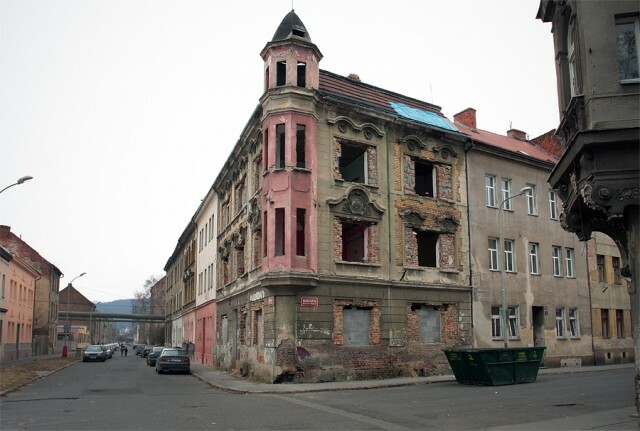 The project was carried out in Predlice district, a problematic suburb in the town of Usti nad Labem*. The area is full of houses abandoned for decades as a result of the heavy historical legacy and the ongoing social marginalization. The project is a simple intervention of installing secondhand electric candelabras, lampions and wall bracket lamps in one of the abandoned houses. The lamps are working during the night, powered by a generator. The intervention results in two contradictory visual impressions. On one hand the light dispersed from the light fittings brings a warm, homelike and vital feeling, while also revealing and making painfully visible the graphic image of the ruin and abandonment. The project is trying to work with oppositions such as curiosity – indifference, domestic – public, memory – oblivion, decline – preservation.